I love reviewing products. Even better, I love reviewing fantastic products. This is a great gig. Lucky can't begin to describe how I feel having had the opportunity to review today's feature product- InfraShine Ceramic 1" Flat Iron. As you know, I have tested several flat irons for the feature reviews. Some make great travel irons; some are better for hair that is already healthy prior to use. Some are simply "plug in and go" irons with no temperature adjustment and others have LCD displays and the ability to choose the temperature which is best for your hair. The InfraShine Ceramic Flat Iron is an iron that I find myself using over and over again, and each time I do, I love it even more. From the moment they were first introduced into the market, InfraShine flat irons established a new standard for performance and quality. Designed to meet the demands of professional stylists, these precision tools are built to last. 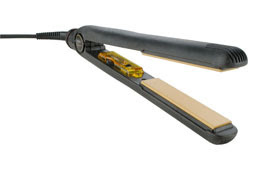 They heat up instantly, generating negative ions that produce even, uniform, and controlled heat along the surface of the iron so you can straighten hair in a single pass and then curl, flip, or press it into virtually any shape or style. They are available in three sizes for maximum versatility. When I first set out to review hair tools and products, I had never heard of InfraShine. Excited to try their products, I agreed to review the flat iron and a blow dryer (coming in a later review). I was a little concerned about the 1" iron's ability to work with my massive head of unruly, semi-wavy, thick hair. I needn't have worried at all. This flat iron works the best of all that I have worked with thus far when used for curling my hair. I find that not only does it create big, beautiful curls, but it also is the only iron so far that has "staying power" (without hair spray). Hours after I use the InfraShine Ceramic Flat Iron, my curls still look great! Another feature I love about the InfraShine Ceramic Flat Iron is its ability to retain heat. The iron heats up fast (with a temperature range between 170 and 400 degrees), and once it's hot, it stays that way. I did not have to make more than one pass on each section of my hair. Because of that, I am able to iron my hair in an impressive 10 minutes with this baby! I love it! Worth mentioning is the iron's extra long cord. I appreciate this feature as I am often multi-tasking in the morning, and need to iron my hair plugged in the bathroom) and sip gulp coffee in the bedroom). I give the InfraShine Ceramic Flat Iron my highest recommendation! Ask your salon or local beauty supply about InfraShine. You can also visit their website for more information an where to purchase their amazing products! Head over to the InfraShine website and tell me another product of theirs you'd love to own. (This is your MAIN ENTRY. This step is mandatory before you can qualify for all the extra entries.) Important Note: Leave your e-mail address in your comment or your Blogger profile. This giveaway is open to residents of the USA. Follow my blog through Blogger. Subscribe by email to living life one day at a time (only verified subscriptions count). Already a subscriber? Leave me a separate comment on this post to let me know you’re already a subscriber and are interested in an extra entry for this giveaway. Snag my button and place it on your blog. Leave me a link to the location of the button in the comments section of this post. Tell me how you found this giveaway. Add this giveaway to a Mister Linky, Contest Site, Forum, Facebook, Myspace, etc. Open to US residents. Contest ends Friday, 10/16 at midnight, EST. Winner will have 3 days to respond or a new winner will be chosen. Email must be in comment or available in profile. Disclaimer: The only compensation received for any review post is a sample of product. Compensation never has a bearing on the outcome of a review. The opinions expressed herein are those of blog author only. Blog author never gets paid to post. I would love to have their RedLine Pro Blow Dryer ! i like the UL2 and it's quiet feature! I found this giveaway on Twitter! I would love to own the 1.25" spring iron. I've subscribed to your RSS feed. I found this giveaway through your tweet tonight. Following your blog :) lol how'd I forgot an entry? Spring Irons 1" I have shorter hair and I dont care if curling it is out dated. I would love either the flat iron or the curling iron!I can't find one that is in my price range. Thanks for Posting! I would love to try the RedLine Dryer. Thanks for the review and giveaway! I would like to try the UL2 Dryer! I found this giveaway thru my email! I follow you through Blogger and Google Friend Connect as "Maggie"
I am already an email subscriber and am interested in an extra entry for the giveaway. I'd love to try the The InfraShine AeroPlus! Found out about this contest from your sidebar, after being sent here from An Island Life's Hot Links of the Week! I like the mini design flat iron. I would love to own the .75” spring iron! I found this giveaway via twitter! I follow your account via blogger. I subscribe via bloglines now also! I'd like to have the Pro Blow Dryer. Thanks! The Redline Pro Blow Dryer looks really nice too. Thanks! I asl like the Redline Pro Blow Dryer! I discovered your site - and this contest- through a link at All Things Bloggy at Life's a Charm. I like the scissors. They look like they would work really good. I'd love to try their Pro Blow Dryer. Thanks! I found you through Prizey. Thanks! I'd also love to get the UL2 Dryer! I would love to have the Pro Blow Dryer. I found this through following you on blogger. I'd like the .75” Spring Iron, because anything bigger wouldn't hold in my hair, and my hair is so thick, the blow dryers would probably only make it warm and wet. I'd love to have the UL2 dryer! Gotta start the style off with a good foundation, right ;) that blow dryer looks amazing! I found your site and this giveaway from @Twincere on Twitter. Found out about this from your Twitter. I really like the UL2 Dryer. It looks sleek and easy to hold! the scissors would work great for cutting my daughters bangs...she has the thickest hair!! I get your newsletter so that's how I found your giveaway. Pro Blow Dryer would be nice!